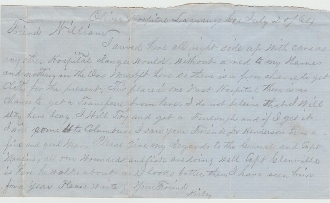 Confederate Soldier's Letter, 2 pages, Oliver Hospital, La Grange, Georgia, July 2nd, 1864 pertaining to the need of cloth for the hospital. "...I arrived here all right side up with care as any other Hospital Ranger would, without a med to my name, and nothing in the Ovr Nus (Nurse) Dept here so there is a poor chance to get cloth for the present. This place is one vast Hospital. There is no chance to get a transfer from here. I do not believe that I will stay here long. I will try and get a Furlough and if I get it I will come to Columbus. I saw your friend Dr. Henderson. He is a fine and good man. Please give my regards to the General and Capt. Manford, all our wounded and sick are doing well. Capt. Glanville (2nd MO Infantry) is here. He walks about and looks better then I have seen him for a year...Kirby"
If you could by any possible means get Kirby 4 yds of gray do it as it will be out of his power to get it himself and you know how much he needs it.